Pack your bags! 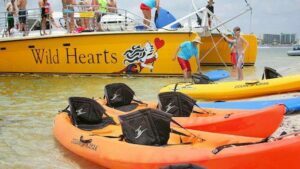 You’re headed to Orange Beach for a Sail Wild Hearts cruise. The summer may be winding down, but that doesn’t mean you can’t sneak in one more weekend getaway before the days get shorter. Book your stay – Whether you prefer a boutique hotel or a cozy beach condo, there are plenty of lodging options in and around Gulf Shores and Orange Beach. Feeling like getting in touch with nature? Bunker down at a local RV park or one of many area campsites. Choose Your Cruise – Once you’re settled in, give Sail Wild Hearts a call or visit us online and reserve your spot on one of our cruises. Nature enthusiasts love our two-hour Snorkel & Sail Tour, and for the adventurers, there’s our high energy Kayak Adventure Snorkel Sail. Our most popular sail seems to be the Family Adventure Sail, a two-hour cruise that features a little bit of everything. Or for just the two of you, go with the romantic Sunset Cruise. You won’t regret it. Worked up an appetite? Venture along one or more of these food trails and discover the best seafood at Fisher’s Dockside, gumbo at Doc’s Seafood Shack, burgers at Luna’s and fun cocktails at LuLu’s. Head Outdoors – Ready to explore the great outdoors? Pier fishing and charter fishing trips are great options for amateurs and pros alike. For the landlubbers, there’s scenic hiking along the Alabama Birding Trail and the Hugh S. Branyon Backcountry Trail. Just make sure to pack your walking shoes and binoculars! Consult the Calendar – When planning your weekend getaway to Gulf Shores and Orange Beach, always check the calendar to see what concerts, events and activities are planned during your stay so you can join in the fun. There’s no better way to spend a weekend than camping, cruising, eating and exploring your way around Orange Beach! Hope to see you this weekend.